Combining all the advantages of lentiviral vectors with the benefits of episomal expression, SBI’s pPACK-ID Integrase-defective Lentiviral Packaging Mix is a great option for researchers who want to express transgenes in mammalian cells. Based on SBI’s popular pPACKH1 lentiviral packaging system, pPACK-ID contains targeted mutations in the POL gene which codes for the integrase protein1. The result is a powerful lentiviral packaging system that is completely compatible with the full range of SBI’s lentiviral vectors, but without integration of the vector into the host genome. This enables transient gene expression in dividing cells and stable expression in quiescent or non-dividing cells. In addition, for researchers interested in gene therapy studies, this system supports transgene expression via lentiviral vectors without the potential risks of insertional mutagenesis. The pPACK-ID Integrase-defective Lentiviral Packaging Mix consists of an optimized mixture of three plasmids: pPACK-ID-GAG, pPACK-ID-REV, and pVSV-G1. The pPACK-ID-GAG plasmid contains the structural (Gag), and replication (Pol) genes which code for some of the proteins required to produce the lentivirus. It also encodes the viral Env gene, which encodes the envelope protein that defines the tropism (e. the range of infectable cells). The defective integrase is also located on this plasmid. The pPACK-ID-REV plasmid contains the regulatory protein Rev that is required for HIV replication. The pVSV-G plasmid expresses the envelope glycoprotein of vesicular stomatitis virus (VSV-G) from the CMV promoter. VSV-G pseudotyped viral particles mediate viral entry through lipid binding and plasma membrane fusion and can infect both mammalian and non-mammalian cells. Sengupta, et al. An Optimized Protocol for Packaging Pseudotyped Integrase Defective Lentivirus. Biol Proced Online. July 11, 2016. 18:14. PMCID: PMC4939624. Figure 1. pPACK-ID provides good transduction efficiency. (Left panel) We packaged SBI’s third-generation lentiviral vector pCDH-CMV-MCS-EF1-copGFP (Cat. # CD511B-1) into lentiviral particles using either standard pPACKH1, which supports lentiviral integration, or pPACK-ID which keeps the transduced lentivector episomal. Transduction efficiency as assessed by the fraction of GFP-positive cells is within a factor of two between pPACK (middle panel) and pPACK-ID (right panel). Figure 2. Lentivectors delivered by pPACK-ID are rapidly lost in dividing cells. HT1080 cells infected with pPACK or pPACK-ID lentivirus containing a GFP marker (Cat. # CD511B-1) were cultured and carried through 8 passages. The relative copy number of GFP was measured by qPCR after passages 3, 6, and 8, in cells infected with pPACK lentivirus, pPACK-ID lentivirus, and uninfected HT1080 cells. After 3 passages, the transgene copy number is similar in both pPACKand pPACK-ID-infected cells, but drops to background levels in pPACK-ID cells by passage 6. Figure 3. Transgene expression is rapidly lost in pPACK-ID-infected cells. 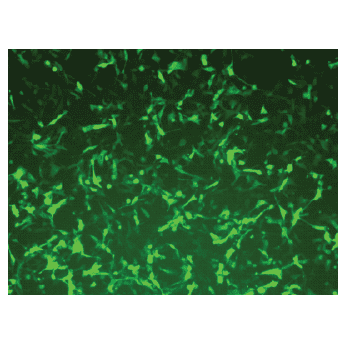 HT1080 cells were transduced with pPACK and pPACK-ID lentivirus carrying a GFP marker Cat. # CD511B-1). Images were taken on days- 3, 6, 12 and 15-days post-transduction, and show progressive loss of GFP signal in pPACK-ID-infected cells, but not in pPACK-infected cells. Figure 4. Transgene expression is stable in non-dividing cells infected with pPACK-ID. Mouse embryonic fibroblast (STO) cells were treated with Actinomycin D to prevent cell division, transduced with GFP lentivirus (Cat. # CD511B-1) packaged using pPACK-ID, and cultured for 18 days. GFP expression remained consistent across the timepoints, showing stability of transgene expression in non-dividing cells.